PLEASE NOTE: Latex products being shipped during cold weather months have the potential to freeze and turn solid. To help avoid this from happening we suggest next day shipping service from approximately November thru April. However ordering during the cold weather months is at your own risk. Studio F/X will not be responsible for products that have been ruined due to freezing during shipment. Colorless, multi-functional and excellent for sealing Nose & Scar Wax or to mold prosthetic appliances. Apply to stretched skin for aging, extreme blisters and wounds. Low ammonia formula for extremely dry or sensitive skin. Multi-functional and excellent for sealing Nose & Scar Wax or to mold prosthetic appliances. Apply to stretched skin for aging, extreme blisters and wounds. FREEZING WARNING NOW IN EFFECT PLEASE NOTE: Latex products being shipped during cold weather months have the potential to freeze and turn solid. To help avoid this from happening we suggest next day shipping service from approximately November thru April. However ordering during the cold weather months is at your own risk. Studio F/X will not be responsible for products that have been ruined due to freezing during shipment. 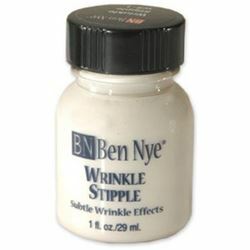 Thinner than Liquid Latex, apply to stretched skin for realistic facial wrinkling, especially around eyes for "crowsfeet". For transparency, apply thin layer of Castor Sealer before coloring with cremes. 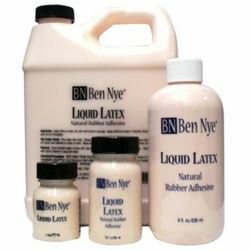 Ben Nye Liquid Latex. FREEZING WARNING NOW IN EFFECT PLEASE NOTE: Latex products being shipped during cold weather months have the potential to freeze and turn solid. To help avoid this from happening we suggest next day shipping service from approximately November thru April. However ordering during the cold weather months is at your own risk. Studio F/X will not be responsible for products that have been ruined due to freezing during shipment. 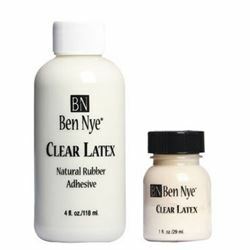 Kryolan Latex Clear, vulcanized liquid latex with especially low content of ammonia. Available in the following colors: natural colors, dyed in skin color, and special colors. Latex is used to create small latex appliances such as noses, chin parts, bald caps, and the like. It can also be used to simulate old or injured skin. FREEZING WARNING NOW IN EFFECT PLEASE NOTE: Latex products being shipped during cold weather months have the potential to freeze and turn solid. To help avoid this from happening we suggest next day shipping service from approximately November thru April. However ordering during the cold weather months is at your own risk. Studio F/X will not be responsible for products that have been ruined due to freezing during shipment. PLEASE NOTE : FREEZING WARNING IN EFFECT: Pros-Aide products being shipped during cold weather months have the potential to freeze and turn solid. To help avoid this from happening we suggest next day shipping service from approximately November thru April. However ordering during the cold weather months is at your own risk. Studio F/X will not be responsible for products that have been ruined due to freezing during shipment. 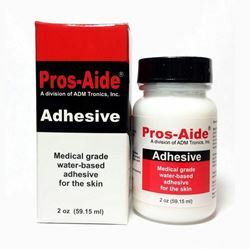 Pros-Aide, the “original” water-based adhesive for the skin. It adheres for long periods without irritation. Pros-Aide® is the leading adhesive used for medical prosthetic applications. 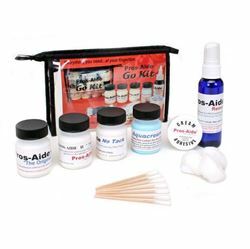 Pros-Aide® is the standard in the industry for adhering appliances and other make-up components to skin. It is safe to use on all skin including sensitive areas. It gives a strong bond and has high water resistance. It is non-toxic and completely safe. PLEASE NOTE : FREEZING WARNING IN EFFECT: Pros-Aide products being shipped during cold weather months have the potential to freeze and turn solid. To help avoid this from happening we suggest next day shipping service from approximately November thru April. However ordering during the cold weather months is at your own risk. Studio F/X will not be responsible for products that have been ruined due to freezing during shipment. 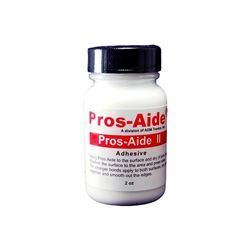 Pros-Aide® II was developed to help eliminate the difficulty of removing Pros-Aide®“The Original” from the skin. It is useful on very sensitive skin or thin areas of appliances and prosthetics. It is also great for short term applications. PLEASE NOTE : FREEZING WARNING IN EFFECT: Pros-Aide products being shipped during cold weather months have the potential to freeze and turn solid. To help avoid this from happening we suggest next day shipping service from approximately November thru April. However ordering during the cold weather months is at your own risk. Studio F/X will not be responsible for products that have been ruined due to freezing during shipment. 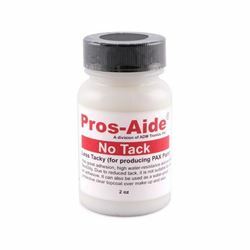 Pros-Aide® No-Tack Adhesive, all the great properties of “The Original” Pros-Aide® but with less residual tackiness. It is used just like Pros-Aide® for producing PAX paint™ but has significantly reduced stickiness or tack after drying. PLEASE NOTE : FREEZING WARNING IN EFFECT: Pros-Aide products being shipped during cold weather months have the potential to freeze and turn solid. To help avoid this from happening we suggest next day shipping service from approximately November thru April. However ordering during the cold weather months is at your own risk. Studio F/X will not be responsible for products that have been ruined due to freezing during shipment. 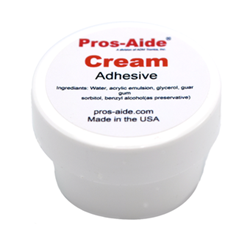 Prosaide Cream, A thick Pros-Aide® adhesive excellent for filling in seams or gaps in appliances and also great for repairs. It does not contain any artificial fillers to make it thick yet has the properties of Pros-Aide® at heavy viscosity. PLEASE NOTE : FREEZING WARNING IN EFFECT: Pros-Aide products being shipped during cold weather months have the potential to freeze and turn solid. To help avoid this from happening we suggest next day shipping service from approximately November thru April. However ordering during the cold weather months is at your own risk. Studio F/X will not be responsible for products that have been ruined due to freezing during shipment. This convenient little vinyl pouch contains every type of Pros-Aide you need as well as the Pros-Aide Remover and cotton swabs for applying and removing. Small bottles are excellent for on set touch ups. Silicone Adhesive Regular Bond is a silicone based skin adhesive of extraordinary tackiness. Silicone Adhesive Regular Bond, is activated by pressure only after all solvent has evaporated. Let the adhesive dry completely before placing the prosthetic onto the skin. Press on tightly once you are satisfied with the position. Silicone Adhesive Regular Bond must be removed from skin with the dedicated remover – Silicone Adhesive Remover. 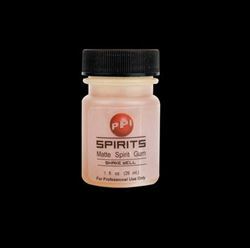 PPI Spirits is the definitive matte lace spirit-gum adhesive. Originally developed and perfected for use on the 2012 Oscar winning film, Lincoln, PPI Spirits is a very strong, fast drying matte adhesive. Making it suitable for all lace hair-goods, as well as appliances. It doesn't yellow the lace, create build-up or get crusty. 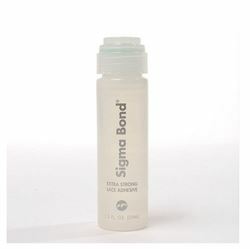 Sigma Bond is an acrylic based adhesive designed specifically for lace front hair systems. Sigma Bond can also bond lace and ploy based hair systems to the skin with superior strength and comfort. It is strong, safe, easy to use and economical. 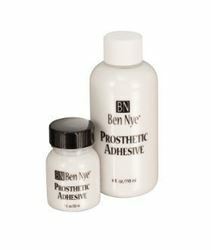 This adhesive is great for daily wear, touch-ups and stays up to two weeks of adhesion. Longer adhesion times can be achieved when used with Top Guard Skin Barrier. Sigma Bond can be easily removed with Super Solv or Super Solv Plus Adhesive removers. This sticky adhesive dries to a matte finish and keeps prosthetic appliances, lace, beards and hair pieces firmly in place. 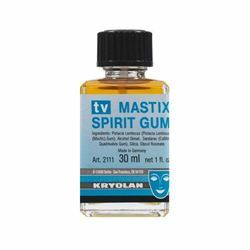 TV Spirit Gum is a make-up artist’s adhesive, especially for adhering hair, beards, and wigs. 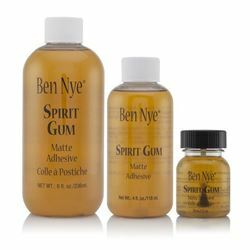 The special mixture of natural resins of TV Spirit Gum means that, after it dries, it appears more matt and more natural on the skin than does normal Spirit Gum. 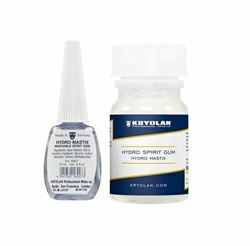 Hydro Spirit Gum (Water Soluble Spirit Gum) is an adhesive for make-up artists, containing no solvent, with water base. Hydro Spirit Gum is effective in adhering objects for short periods of time, and for holding down hair and eyebrows before they are covered with a bald cap or plastic film. The superior polymer acrylic formula is the perfect "B" adhesive alternative. It dries clear and is easily mixed (within limits) with water, alcohol or acrylic paints. Beta Bond has an excellent vertical hold and is non-flammable. This gelled version of SDA-40 alcohol and isopropanol can be used in any application where 99% isopropyl alcohol is used. ISO-Gel has a reduced alcohol scent, will not drip or run, and is excellent as a vehicle for alcohol based color applications. ISO-Gel DOES NOT contain Cabosil or TS100. 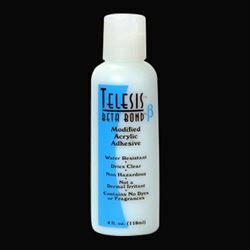 Telesis 8 Applicator Pen is excellent for quick applications and touch ups. This is a medical grade, pressure sensitive adhesive, perfect for bonding silicone and latex pieces, especially around the eyes and mouth or other areas that are troublesome to glue down. Available in 1/2oz pen applicator. 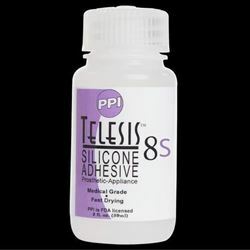 TELESIS 8 SILICONE ADHESIVE is the newest addition to the evolution of the Telesis silicone adhesives line - the most popular and widely used adhesives in the industry today. When used with the Telesis Modifier the drying time is much faster, giving a working time similar to Telesis 7. This is a medical grade, pressure sensitive adhesive, perfect for bonding silicone and latex pieces, especially around the eyes and mouth or other areas that are troublesome to glue down. The ideal adhesive for laying hair goods and lace pieces. The matting agents are mixed intrinsically during the manufacturing process which ensures a fluid consistency so the adhesive never gets hard or cracks - it dries matte and stays matte. 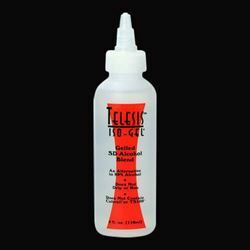 Telesis 8 Matte Adhesive is pliable and will move with your actor's face and will not damage your lace hair goods. Available in 2oz bottle. For thinning adhesive and priming the skin. 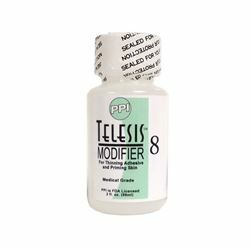 To accelerate the drying time of Telesis 8, prime the skin with the Modifier and then apply Telesis 8 to the appliance. Once the two surfaces connect, the drying time will take only a few moments. Designed to offer a longer working period, this formula is excellent for use in high heat and humidity situations. Telesis 8s will not damage silicone or latex appliances. K.D. 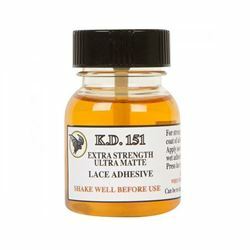 151 Matte Lace Adhesive is a professional adhesive that is designed to be used on any laced hair pieces for long lasting adhesion. Shake well before use. 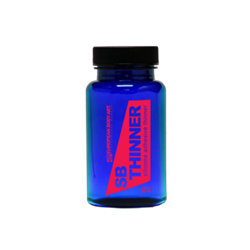 Available in 1oz bottle. A strong silicone based adhesive to use for Plastic or Latex Bald Cap applications. 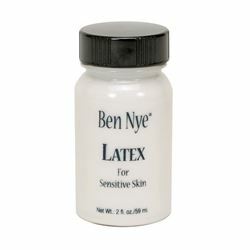 Also can be used to adhere Foam Latex and regular latex prosthetics. It's water and perspiration resistant, pressure sensitive , has a strong bond and safe for the skin. Silicone Adhesive Thinner is used to thin Silabond adhesive at 10:1 ratio (Silabond:Thinner) or as desired. 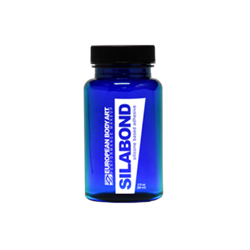 Adding SB Thinner to Silabond will reduce drying time. Telesis 5 Thinner is a non-flammable, medical grade thinner designed for diluting Telesis 5 Silicone Adhesive. Available in 2oz bottle. This is a medical grade, pressure sensitive adhesive, perfect for bonding silicone and latex pieces, especially around the eyes and mouth or other areas that are troublesome to glue down. Available in 2oz bottle.